The Petite Goldendoodle is not a purebred dog. 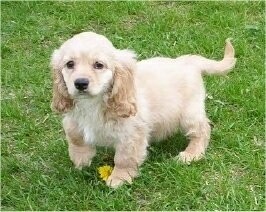 It is a cross between the Golden Retriever, Poodle (Toy, Miniature or small Standard) and the Cocker Spaniel. Breeders are producing a much smaller Goldendoodle (Petite Goldendoodle) by first downsizing the adult, breeding female Golden Retriever. Breeders accomplish this by crossing the Golden Retriever with a Cocker Spaniel. The puppies that come from this cross-breeding are called Golden Cocker Retrievers. The Golden Cocker Retriever is bred with a Miniature Poodle (either by natural breeding or surgical / artificial insemination). The Petite Goldendoodle puppies are ½ Poodle, ¼ Golden Retriever and ¼ Cocker. The Petite Goldendoodles will be smaller dogs when grown because of the downsizing of the mother dog. The best way to determine the temperament of a mixed breed is to look up all breeds in the cross and know you can get any combination of any of the characteristics found in any of the breeds. Not all of these designer hybrid dogs being bred are 50% purebred to 50% purebred. It is very common for breeders to breed multi-generation crosses. Note: Some breeders are using other types of spaniels besides Cocker Spaniels to create a Petite Goldendoodle. Be sure to ask the breeder what exactly is in their lines of dogs.